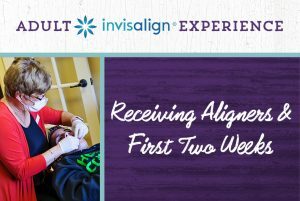 After two weeks of waiting for things to begin, I look forward to getting started on this process of Invisalign! The appointment was pretty simple today. I went to the office where the doctor showed me the aligners and how they look. The aligners pretty much look like the retainers I had that were destroyed by the aforementioned puppy. Note to self: the CASE they gave me will certainly need to be the home for my aligners at ALL times, to avoid any issue. After my visit, I felt assured that the process will be easy and straightforward. My only job was to make sure that each tooth was seated in the aligner before I went to the next one. They told me what to look for and the doctor even gave me her cell number if I needed anything! What a great experience! Aligner #1 of 18 went in that day and I could already tell it was going to be tight. Talking was a challenge and that was a concern, but I knew it was only the first few hours and I would adjust. That evening, talking was a challenge. I was certainly drooling, as if my mouth was trying to salivate and dissolve whatever was in my mouth. Suddenly, I felt like this is going to be a long process. My only concern was that the inside of the trays seemed to be rubbing against my tongue some. All of this was new to me and I knew it would be better soon. As a side note, the office called to check on me and see how things are going! I have received nothing but amazing care from this office and they truly care about my result of an amazing smile! I am looking forward to that day too! Aligner #2 of 18 is going in today. It has been two weeks since I put in the first aligner. I can tell you that the SMELL and cleanliness of these trays is important to me. It is hard to feel fresh when you have the plastic in your mouth. Brushing and flossing often has helped, but I have seen the trays get pretty squeaky-clean using hand soap to clean the aligners as recommended by the office. To clean the aligners, I use an old soft toothbrush and place the antibacterial soap into the tray. Brushing that into each tooth and rinsing has given the trays new life! It is nice, however, to get a fresh set of trays this week. This set of Invisalign aligners went in just as tightly. It was not as foreign to my mouth so there was very little adjustment. As a bonus, nothing seemed to be rubbing against my tongue at all with this set. I am just thankful to be progressing to the next set! I cannot visibly see movement yet. I will keep you posted for the next set of aligners!